A small fishing and farming community that also happens to have some of the best diving in the Philippines, Moalboal is located on the south-western coast of Cebu, just a 2 hour drive from Cebu City. Discovered as a dive destination in the 70s, Moalboal quickly became a favorite among divers due to an incredible near-shore reef, nearby Pescador Island and of course the now well-known ‘Sardine Run’. Diving – Moalboal’s healthy near-shore reef with its abundance of marine life runs the length of the coastline and is a worthy site for both divers and snorkelers on its own. Add Pescador Island, just 15 minutes off-shore, with its deep drop-offs, bottomless walls, great pelagics and Cathedral Cave and you already have a hot dive destination. 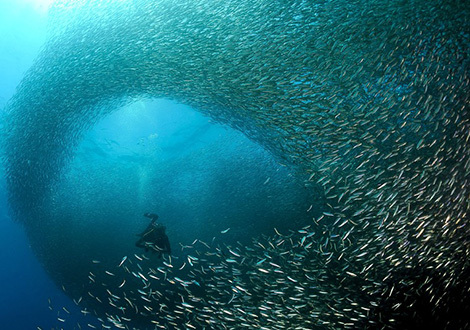 And then, there’s the Sardine Run. Sardine Run – Moalboal’s Sardine Run is the cherry-on-top making divers from around the world book a ticket to what was previously a relatively unknown fishing village. Picture the ‘bait balls’ you’ve seen on Planet Earth, millions of fish moving together in amorphous and rapidly-changing blobs and streams, then picture yourself in the center of it. This resident mass of fish can be found immediately off the shore of Panagsama Beach, close enough to watch the surface disturbances from your dinner table. To divers living on Guam: This is a no-brainer. Right in our neighborhood and easy on the pocket-book – do not miss it! What to do – Incredible diving aside, there are also a few notable adventures to be had top-side. Kawasan Fall – a picturesque waterfall and refreshing place to have a swim. Kawasan Falls can be visited in one of two ways: 1) The easy way – catch a ride directly to the falls, or 2) The fun way – take a canyoneering trip starting upstream and following the Matutinao River down to where it reaches the falls. Busay Cave and Spring – an easy cave adventure nearby with a refreshing spring. Whale Shark tour – Moalboal is near enough to Oslob to make a half-day trip to see the whale sharks. Can also be combined with a trip to Kawasan Falls. The Philippines has many great marine sanctuaries which provide incredible diving and require small fees for diving and often for camera use. These are relatively inexpensive and may vary depending by destination and specific dive sites. Sanctuary fees are paid directly to your dive operator and are not included in dive packages. Most major international carriers will get you to Manila International Airport (MNL). From there it’s a quick domestic flight, 1.5 hr southeast, to Cebu City. All MDA packages include full service, air-conditioned airport transfers between Cebu Airport and your resort in Moalboal. Moalboal is a great destination to dive year-round. April and May tend to have the best weather and the most visitor traffic. Dry season extends from December – May, with wet season from June – November.